My name is Liz. My hair is brown. I am a biker, a wannabe athlete, and an outdoors lover. I can oscillate between eccentricity, anxiety, and assertiveness, but I identify as a dog-mom regardless of the hour. These characteristics help describe me but don’t fully depict who I am. Can eight labels capture the complexity of a human being? In our culture, just a single non-normative trait often determines an identity. A disability, for example, functions as an automatic decider of what an individual is: “handicapped”. Who an individual is becomes irrelevant. My experience with this process of othering, cemented over centuries, comes from another way I define myself. I work at the National Ability Center (NAC) in Park City, Utah. We are leaders in providing adaptive recreation and outdoor adventures for people of all abilities. My official title at the NAC is “Education and Community Programs Manager”. But, even this title falls short of capturing the myriad of roles that I fill. I support international programs that teach adaptive sports; I work with American universities to shape student education; the other day I reassured a parent whose child will be born with Down Syndrome. No person, or job, is composed of one thing. The issue with naming is central to all topics I address daily. I believe in person-first language, a grammatical tool with the power to transform reality. When we put an individual before a descriptor, the person has the opportunity to define themself. For example, I have seen the implementation of person-first language change a family’s relationship to their loved one. A sentence like “my autistic sister loves horseback riding” implies that her interest can be attributed to her disability. However, “My sister loves horseback riding and has autism,” puts her hobby and disability on the same plane: distinct parts of her joined by a conjunction. Along with correcting a warped understanding of an individual’s proportions, person-first language rewrites the stagnation of self-perception. “Disabled” fixes a person’s identity in time. It negates the development that comes with experience. Most recently, I’ve seen person-first language account for growth in a man named Rob. He has a congenital physical disability and was born with limbs of different lengths. At home in Thailand, Rob was societally excommunicated as “deformed.” He was not expected to have a job, travel independently, or become an athlete. When he first came to the NAC, this cultural experience reflected his expectations of how he’d be treated. The perception that people with disabilities have limited potential is an international cultural phenomenon. Like Rob, quite a few American participants begin our adaptive recreation and adventure programs habituated to being catered to and pushed around. But, at the NAC, we teach that individuals using wheelchairs should be asked if they want assistance to be lifted or moved. By the end of Rob’s trip to the NAC, he was able to climb the indoor rock-climbing wall. He put on his harness and got to the very top on his own. When people are given the chance to climb a wall, or to manage their behavior, they are given the space to grow independently. Rob’s leg length is irrelevant to the expansion of his capabilities as an autonomous person. He is not “a disabled person who climbed the wall.” He is Rob, and he climbed the wall. When competence is assumed, personhood is implied. This idea is essential to our mission at the National Ability Center. It is why we believe in the #adaptivenation: a future world in which all people are considered in the choices we make to shape our society. The names we give each other and ourselves are a foundational starting point in confirming our shared humanity. A person-first philosophy creates the opportunity for self-definition. The complexity of your identity is yours to determine, whoever you are. Within her role at the National Ability Center, Liz supervises Therapeutic Recreation and COACH (Creating Opportunities for ACHievement) Internships. In addition, Liz manages the consistency and quality of all training and education opportunities, including internal staff and volunteer trainings through conferences and professional workshops. Finally, she cultivates the development team leaders of National Ability Center’s year-round Camps and Community Programs. 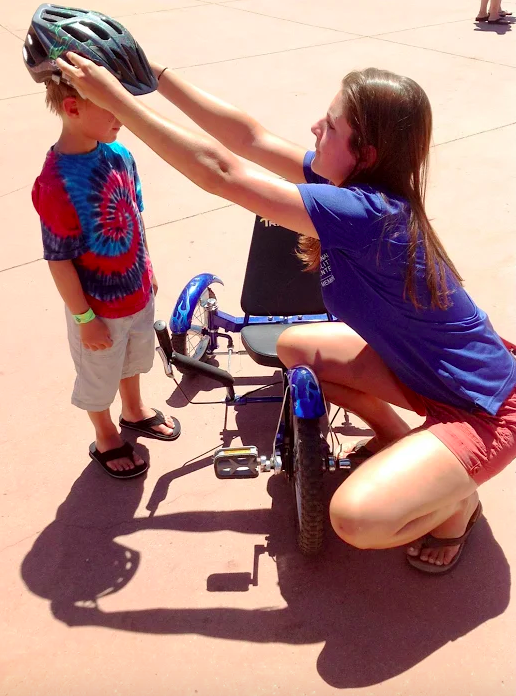 A Utah-licensed Therapeutic Recreation Specialist (TRS), Liz brings a Bachelors in Therapeutic Recreation and a Masters in Adaptive Physical Education to the National Ability Center, as well as teaching certificates in state- and nationally-accredited programs. As a volunteer snowboard instructor, she is also a member of the Professional Ski Instructor Association - International and supports NAC staff as they work toward their different levels within the certifying system. Liz believes that it is a human right to lead a healthy, happy, purposeful life. She works to help individuals focus on not just what they can do, but on what they do well. Allowing them and their support networks to better understand their strengths, passions, and internal motivations to live that quality life as independently as possible.